Luis Enrique’s Barcelona side made the enviable trip to Paris on Valentine’s day for a last-16 first leg clash with Paris Saint-Germain. Both sides are experiencing average domestic campaigns by their lofty recent standards and the Champions League thus takes on great significance as an alternative way of enjoying a successful season. For most of the first 15 minutes the home side were intent on pressing Barcelona all the way up to ter Stegen, aware of how significantly Barcelona’s threat would be reduced by an ineffective build-up. There were a number of interesting aspects in PSG’s pressing that allowed them to prevent Barcelona building attacks from deep. From their nominal 4-3-3 shape, the roles of the front 3 were crucial. 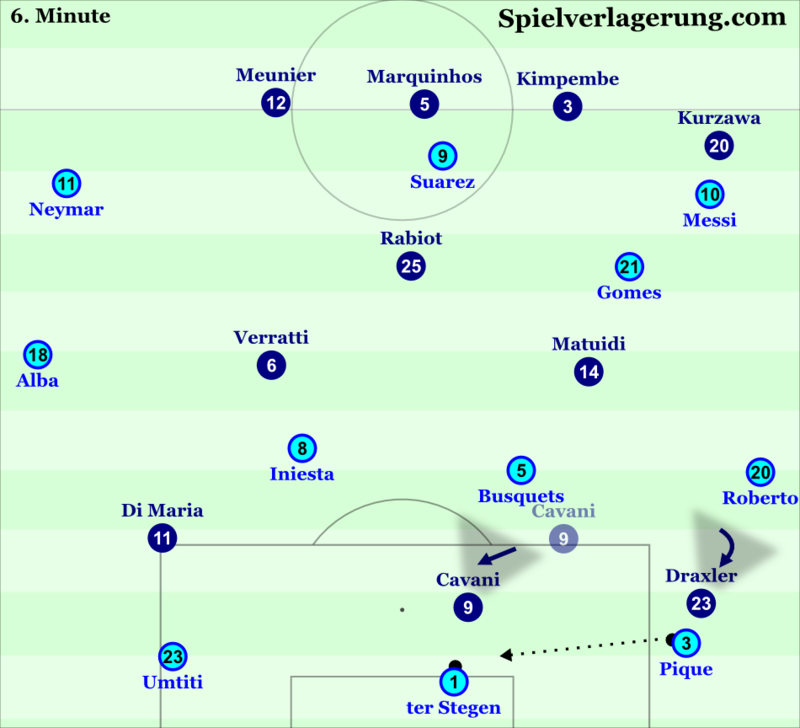 Draxler and Di Maria were half space focused, particularly when ter Stegen had the ball. They were positioned for quick access to Barcelona’s centre backs and they often pressed them diagonally to put pressure on the carrier and block the pass to the full back behind them. The half space focus of the PSG wingers had a positive effect on their pressing, particularly allowing them to prevent Barcelona making gradual switches across the pitch in build-up. Due to their proximity to Pique and Umtiti, Barcelona were unable to use half space switches to relieve pressure. Furthermore, from this position they could easily move towards the centre and press ter Stegen to force him to pass back into the congested side of the pitch and increase PSG’s chance of regaining the ball. From his central striker position Cavani was tasked with putting pressure on ter Stegen but also blocking the passing lane to Busquets. By pressing vertically on any back passes to the German goalkeeper, Cavani could fulfil both tasks in the same action. When the ball was with either Barcelona centre back, the Uruguayan striker would drop deeper, since blocking Busquets was his primary task. Verratti and Matuidi operated in a man-oriented fashion in high pressing phases. By maintaining short distances to Iniesta and Gomes/Messi respectively they could direct Barcelona away from midfield due to the risky nature of the ball-player-opponent distance. Against the Parisian press, Barcelona’s immediately obvious passing option became the chipped pass from ter Stegen to the full backs since they had the biggest distance to any opponent. However, the natural characteristics of long passes meant that the full-backs were often put under pressure upon receipt of the ball. This led to a number of ball losses since Barcelona often lacked appropriate support structures and connections to assist the full-backs in these situations. These struggles against PSG’s high pressing in the early stages contributed to an unstable start from the Spanish champions. Perhaps the single biggest contributing factor to Barcelona’s defeat was their poor performance without the ball. These issues were characterised by a total lack of intensity and a shockingly weak (and at times absent) team-mate orientation. Perhaps a generally understated point is the effect that intensity has on structural aspects. Without an appropriate intensity level of structural movements in all phases, a team will have glaring structural weaknesses since players will be late to arrive in the right positions. If ever evidence was needed, Barcelona’s performance provided it. The generally unintense nature of Barcelona’s defending provided very little challenge to PSG’s circulation. This was surprisingly the case even in high pressing phases. The Catalan side often operated with a high block but lacked intensity and access to direct PSG’s build-up. This led to numerous instances of the Parisian side breaking out from Barcelona’s pressing and thus accessing large spaces to attack through in midfield. This became an even larger issue in the second half. Since they were behind, Barcelona sought quicker access in high pressing phases and did so with a highly man-oriented approach. However, the lack of group and individual intensity meant the home side could easily win individual duels, this inevitably meant that the whole man-oriented system collapsed. This was evident in PSG’s 4th goal as well as many other instances. An issue within this was a generally slow reaction to put man-orientations aside and protect dangerous spaces when an individual duel had been lost. The likes of Meunier could thus dribble forwards unchallenged with the surrounding Barcelona midfielders too slow to move away from marking their direct opponents. Barcelona’s lack of intensity manifested in slow ball-oriented shifting, meaning the Barcelona block reacted poorly to simple ball circulation from Emery’s side. This was the case against simple horizontal passes and particularly changes of depth which were enough to create large vertical disconnects in Barcelona’s structure. Perhaps a bigger issue than their weak high pressing was the poor level of team-mate orientation in midfield pressing. Team-mate orientation, as the term suggests, is basing actions off the actions of a team-mate. In defensive phases, particularly deep and midfield pressing, this manifests in simple reactions to certain players moving out of position. When a midfielder pushes forward to press the ball, it follows that the midfielders besides him should move to narrow the gap he just left. Barcelona constantly failed to execute this basic zonal principle, and as such there were numerous instances of the likes of Iniesta moving forwards to press and no one moving to cover the space left behind. There were further group-tactical communication errors where two or three midfielders would step forwards to press simultaneously. The flat shape that resulted from this allowed easy access to the 10 space into the likes of Di Maria. This failure to react to team-mates’ movements, combined with the low intensity nature of these movements meant Barcelona had very little control over PSG’s possession game. 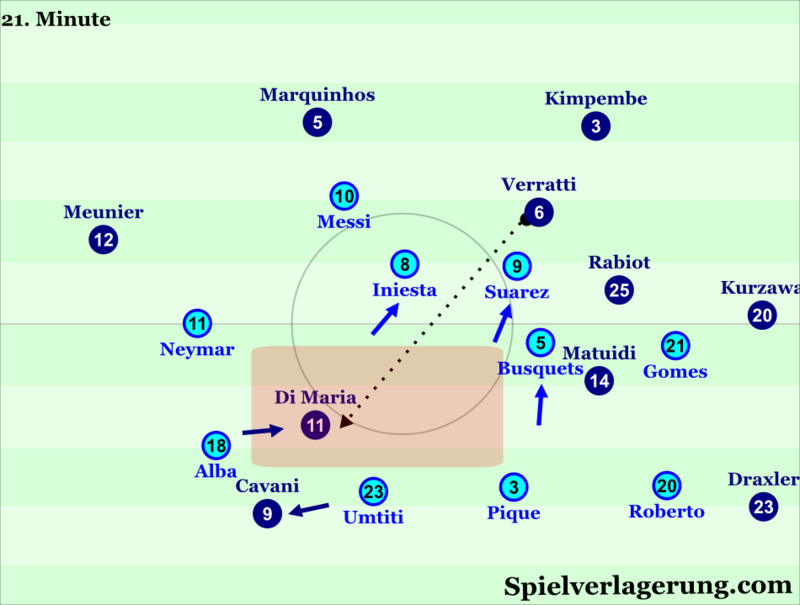 The unintense nature of the Catalan side’s performance extended to a possession game that failed to create advantages against PSG’s defensive scheme due to slow structural movements leaving the ball carrier isolated. 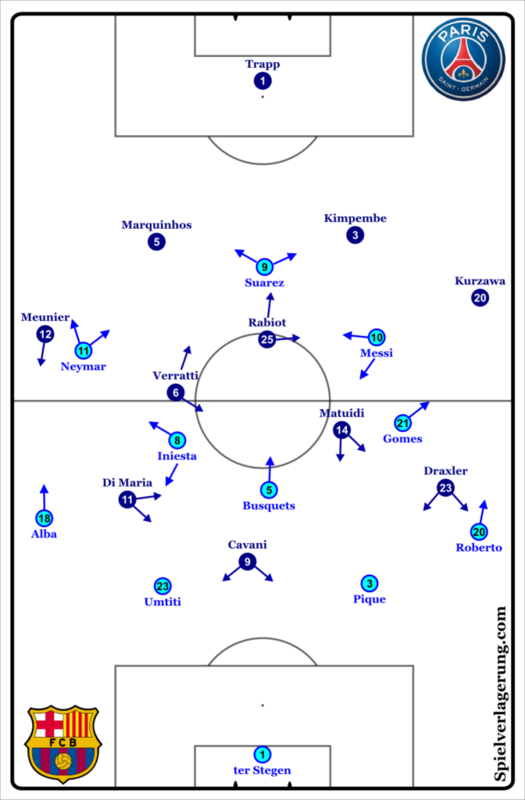 In midfield pressing phases, the Parisians defended in a 4-1-4-1-0 defensive shape, with the “0” referring to the absence of pressure on Barcelona’s first line of build-up, with Cavani man-marking Busquets. The 8s were thus responsible for pushing forwards to block Pique and Umtiti dribbling deep into PSG’s defensive shape and close the passing lane into the likes of Messi. Matuidi was often more active in pushing forwards than Verratti, perhaps to limit Pique’s superior distribution skills. Barcelona’s ball circulation was sluggish and ineffective resulting from slow or non-existent structural movements meaning the ball carrier often had few passing options. In response to Busquets being man-marked, Iniesta often dropped deep in the left half space to receive from Umtiti. However Neymar and Alba were often too slow to react to this movement. With Iniesta vacating the 10 space, an appropriate structural response would be for Neymar to move into this space from the flank, and Alba to move higher on the wing. However, they often failed to make these movements quickly enough, and this combined with Verratti stepping forwards to press Iniesta was enough to force the ball back. The resulting negative aspect of these slow or absent structural movements, was a possession game based heavily on individuals such as Messi and Iniesta to advance the ball. When in direct opposition with PSG’s zonal defensive scheme this saw the likes of Messi isolated and swarmed by 3 opponents thus causing easy turnovers. 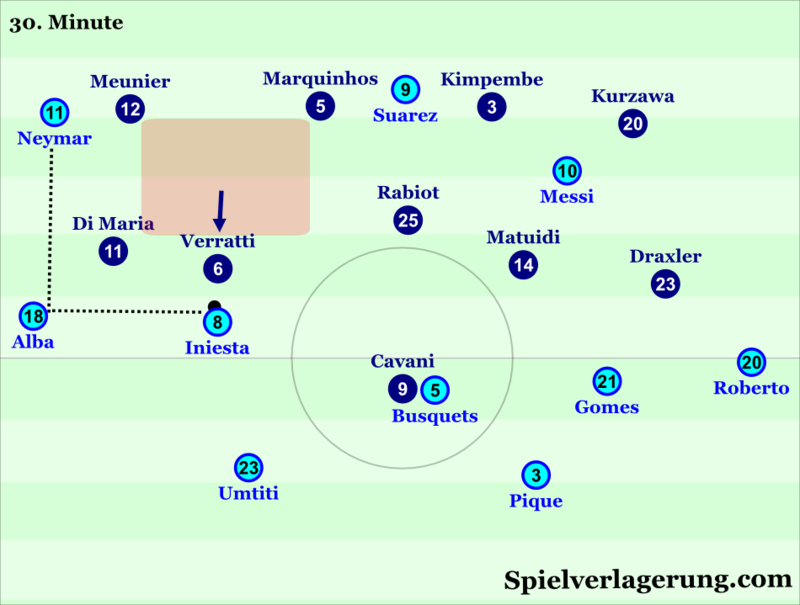 On numerous occasions, Messi, Iniesta or Neymar were isolated against 3 opponents and the surrounding Catalan team mates failed to move out of oppositional cover shadows to create options to retain the ball. Another aspect of Barcelona’s circulation that suffered from these poor structural movements was the axis upon which their possession operated. The ball-far players often failed to move efficiently to create diagonal passing options since they were often slow to move out of oppositional cover shadows. As such the ball circulation was on a very horizontal and vertical axis, lacking much variation and making defensive adjustments easier for Emery’s men. Emery’s PSG side secured a convincing victory that practically ensures their participation in the quarter final. Part of the reason Emery was brought in was due to his outstanding European record, and this victory will give hope to fans that they are a major contender to win this years Champions League. Although they were up against a very poor opponent, the home side demonstrated a well structured high and midfield press. This combined with the excellent talents of the likes of Di Maria and Verratti makes them a strong side. As for Barcelona, the level and manner of the defeat are a massive blow, and the failure to execute basics hints at fundamental coaching problems, perhaps on both a tactical and social level. The Catalan giants are a point behind rivals Real Madrid who have 2 games in hand to build a big gap, and it will take a huge turnaround to recover that. A Copa Del Rey final against Alaves represents their most realistic chance of silverware. These competitive failures, allied with increasing concerns over the playing style may signal the end of Luis Enrique’s reign in Catalunya. I don’t quite agree with you blaming lack of intenity as a major reason for Barcas poor performances. I have watched almost all Barca games under Enrique. He started off loosening Barcas tight structures to allow more freedom and showing of individual class. Fair enough. Over the last months though Barca has LOST his structure especially when HAVING THE BALL, forcing players to close huge gaps once the ball is lost. Everything Barcas players have to do now defensively happens under great stress resulting in an overall exhaustion of the team that some critisize as lack of intensity. It is a great difference though run 10 km in a well structured environment or in a chaotic struggle. I agree with you partly, they were less intese than usually but they also completley failed to make any combination play whatsoever, and failed to enter half spaces only a few times messi, iniesta or neymar but with no real support most times, they were also bad at building up when PSG waited at centre of pitch with 5 man midfield line, barcas players didn’t move enough to open up space and find free room no they just waited at their positions that’s why barca was so bad at this game, and PSG was very disciplined they were always close to each other leaving almost no space in halfspaces to pass the ball only on flanks there was some space and in behind the defence, but as we know barca doesn’t play long balls and PSG used that to their advantage, very smart from Emery deserved victory. that is exactly the point: if the cobweb is not tight don´t blame the threads for not being intense enough. it’s not that the players don’t move enough, it’s that they are not exactly sure where to move next. Yeah, the issue is that we’ve (naturally) looked at this game from different perspectives. You’re looking at it with previous knowledge on Enrique’s Barca, which allows you to explain the cause of this lack of intensity. However this was a match analysis, and as such I analysed the factors in the game. Also, I don’t watch Barcelona games very often so don’t have the full context to judge what led to this poor intensity. Totally agree with you. I mean: a Barca team, not intense enough (true enough) against one of their favourite opponents in their favourite competition!! man, something is going seriously wrong!!! by the way: congrats to Emery: he managed to exploit all of the weaknesses Barca has shown in the last months. As a blueprint (for anyone interested): watch betis:barca from a few weeks ago.